Step by Step | Redeemed! When we first brought Knockout home 3 1/2 years ago, he was a bit hesitant about trailer loading. So, trailer loading was one of the very first things we worked on. It did not take long for him to become confident and even eager to load up. For the last three years, he has been a super easy loader with no issues. Across this winter, Knockout has become increasingly hesitant about loading. It started as a small thing…just a slight hesitation at the trailer door on a dark night. I started going in front of him to lead the way and bolster his confidence, which seemed to help. However, as time passed, he started hesitating even with me leading…and the hesitation became much more than momentary. I was always able to get him to load, but it sometimes took several minutes. Now, I am usually quick to address issues as they arise. Far better to deal with minor issues than to wait and let them become major issues. However, with the protracted rain and cold through the winter months that just hasn’t happened. Most of the winter trailer loading was to visit the farrier, usually in the dark, cold, and wet…usually running behind schedule for our after-work appointment. So, I would make a mental note that we needed to spend some time addressing the issue within the next few days…but the time never came…because the rain and cold virtually never let up. So, last week when I unloaded Knockout at a local roping practice, I took the time to work with him a little. I asked Knockout to back a couple of steps, stop, then come forward a step. Then back one step, stop, and come forward two steps. We did several minutes of simply going back and forth, one step at a time, inside the trailer. Initially, when Knockout backed, he wanted to turn his head to look behind him, but I asked him to face forward and look at me, instead. Finally, I backed Knockout to the very edge of the trailer and signaled him to step his hind hooves down. He responded by going all the way out of the trailer…which is not what I asked for. So, I asked him to load back in the trailer. We went back and forth, one step at a time, a few times, then I again backed him to the very edge of the trailer, where I again signaled him to step his hind hooves down. He stepped off and I signaled a stop. Knockout stood still with his hind hooves on the ground and his front hooves in the trailer while I petted and praised him. Next, I asked Knockout to step his hind hooves back in the trailer. He did so without moving his front hooves forward, so he was just sort of teetering on the edge. I praised him then asked him to step his hind hooves off again. We repeated that a few times, then I asked him to go ahead and back all the way off. Then we loaded just his front hooves on and backed off again. Then we loaded him all the way on, walked to the front of the trailer, backed all the way to the edge, unloaded his hind hooves, paused, then unloaded his front hooves, backed out of my way so I could get off the trailer, and called it good for one lesson. We saddled up and enjoyed the practice. Later that evening, when we got home, we repeated the same lessons at home before feeding and turning out to pasture. So…why did I handle the lesson this way? What was the point of the step-by-step back and forth both on the trailer and at the trailer edge? Why did I ask him to face forward and not look behind himself while backing? To understand the reason we have to understand the source of the issue. Knockout’s refusal to load was not stubbornness or defiance. He was not being disrespectful or willfully disobedient. Knockout’s issue was a lack of confidence. He felt unsure of going inside that dark trailer, and the longer I let his fears go unaddressed the more fearful he became. The solution to overcoming his fear was to build his confidence in me, in regard to moving inside the trailer. I asked for the fine control of one step at a time, because that requires Knockout to really focus and pay attention to me. When he’s paying attention to me, he has more confidence in me, and his fear of circumstances just sort of dissolves. Likewise, I asked him to face forward and not look back while unloading, because I want him to place his total trust in me and learn he can trust me to direct his feet and to let him know when to step down. So long as he is looking back, he is relying on his own instincts…including his instinct that the trailer is a scary place. To move past his fear, we needed him to place his total trust in me and to focus his attention on listening to me one step at a time. See, the solution to overcoming Knockout’s fear is to replace his fear with faith in me. And the best way to help him increase his faith in me is to let him practice trusting me and finding me faithful by putting him in a situation where he has to trust me to guide him one step at a time. Looking at it from Knockout’s perspective, I was asking him to remain in the scary circumstances much longer than necessary. I could easily have simply let him unload from the trailer and gone about our business. However, if I had done that we would have missed a really good learning opportunity. He would have been out of the trailer quicker…but would not have learned to trust me to direct his steps…and the next trailer loading would have been a much more stressful and lengthy process than necessary. Whether Knockout realizes it or not, staying longer in the trailer and working through his trust and confidence issues was for his own good. He has become a braver, calmer, more trusting horse through that process. Isn’t this similar to how our Heavenly Father teaches us to trust Him? I can think of numerous situations in which I asked God to address a difficult situation. In nearly every case, God allowed me to remain in that situation much longer than I would have liked. However, through that situation He was faithful to remain with me and direct my steps. Most of the major learning experiences of my Christian walk have been things I have learned during these difficult situations. God is such a faithful friend! 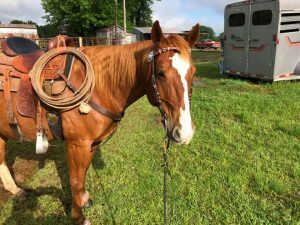 This entry was posted in Faith, God's Position toward Us, Horses and tagged courage, faith, faithful, horse, horsemanship, horses, step, trailer, trailer loading, trust by joe. Bookmark the permalink.